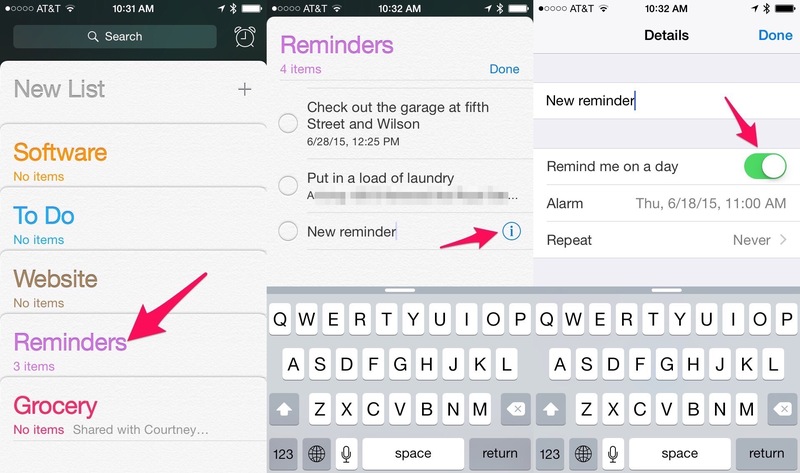 Apple’s Reminders app is a powerful, but perhaps overlooked, tool that you should be using. Unlike many of the built-in iOS apps that Apple pre-installs on your iPhone and iPad, the Reminders apps provides one of the best experiences in its genre. That’s because it has access to some deep-level features of iOS including Siri. So let’s get into why you want to use it. In one hour, remind me to go for a walk. At 3 PM remind me to call Mom. On Thursday remind me to visit Jon. In two weeks remind me to pay the water bill. These are just some examples. Play around with Siri and see how vast her abilities are in creating time-based reminders. If you need to edit any of these, you can always do so in the Reminders app. When I leave here, remind me to pick up milk. When I get home, remind me to start the wash. Remind me to check my paystub when I get to work. When I come back here, remind me to call Dad. You’ll want to experiment with creating reminders using Siri. It can be very useful and a ton of fun! Add bread to my Groceries list. Add Ski Safari to my apps list. Read me my to do list. Show me my shopping list. Apple has really outdone themselves by letting users harness the power of the Reminders app for creating lists. This is one way to get organized and more productive every day. If you want to colaborate on your lists, you can share them with friends and family members. One instance when you might want to do this is for sharing a shopping list between family members. First you’ll need to make sure your reminders are using iCloud. Go to Settings->iCloud and make sure Reminders is enabled. Other people you want to share with will need to do this too. Back in the Reminders app, open a list and tap edit. Then tap Sharing and pick contacts to email. This will email them a request to join your list. Once they do, everyone will be able to add and delete items or mark them complete. Each person will also get alerts time-based items or get a personal alert when they enter the GPS radius of a location-based item. Its a very handy way to get things done as groups. If you own an Apple Watch, one of the first things you probably asked yourself was “where’s the Reminders app?” Sure you can add reminders using Siri on the Watch, but an actual app is lacking. Reminders Nano fixes this by bringing all of your wrist in a very native-looking interface. With Reminders Nano you can see all your lists, add new lists, add reminders via dictation, and even mark them as completed. This is the app Apple should’ve included by default. But who cares, Reminders Nano does it all. Once you start digging into the Reminders app, you’ll quickly see that this is a feature-rich utitily. Try some of the suggestions above and if you find something confusing or useful, let us know in the comments below!